It doesn’t take a rocket scientist to realize the NCAA is a self-serving institution. It makes countless billions (with a big old ‘B’) off the student-athletes it alleges to protect. The debate over whether college athletes should be reimbursed for their services with something other than room, board and tuition has come to the forefront. We can largely thank Ed O’Bannon for that. 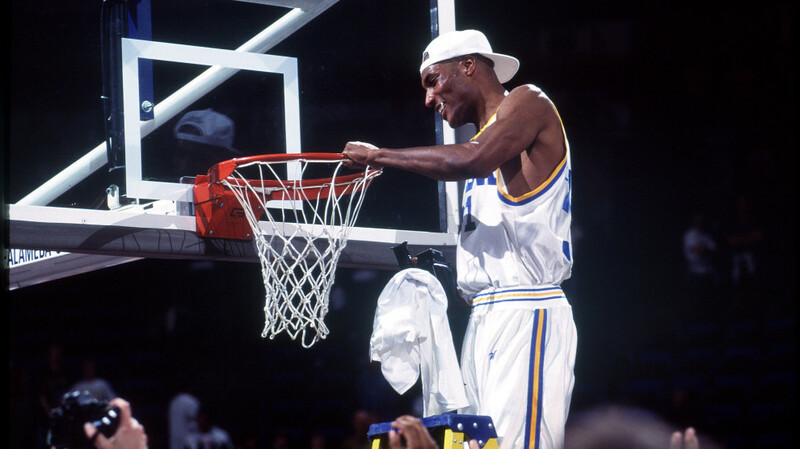 In 1991, Ed O’Bannon was the nation’s top basketball recruit. He ended up attending UCLA and, alongside his brother, won a national championship his senior year. He was named the tournament’s Most Outstanding Player. He played in the NBA, drafted ninth by the Nets in 1995 but nagging knee injuries limited a successful career. 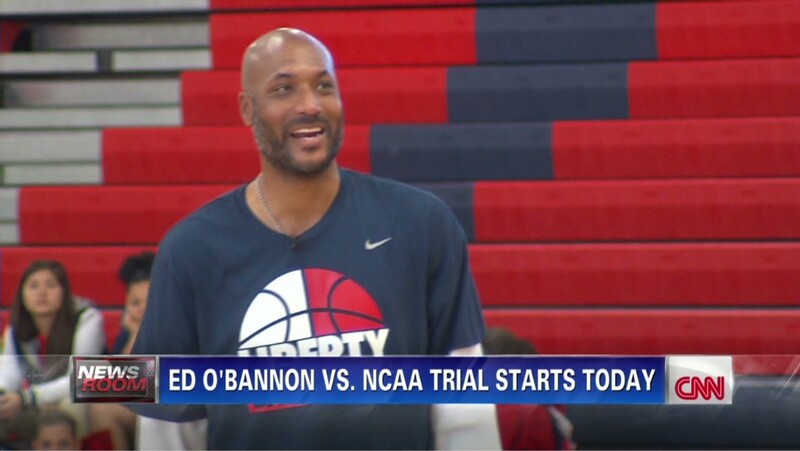 History may remember O’Bannon better, however, for his work off the court. It wasn’t until he saw a friend’s son playing video games that O’Bannon’s name re-emerged into the public eye. The boy was playing EA’s NCAA Basketball. The team he was playing bore O’Bannon’s name and likeness for which he hadn’t received a penny. 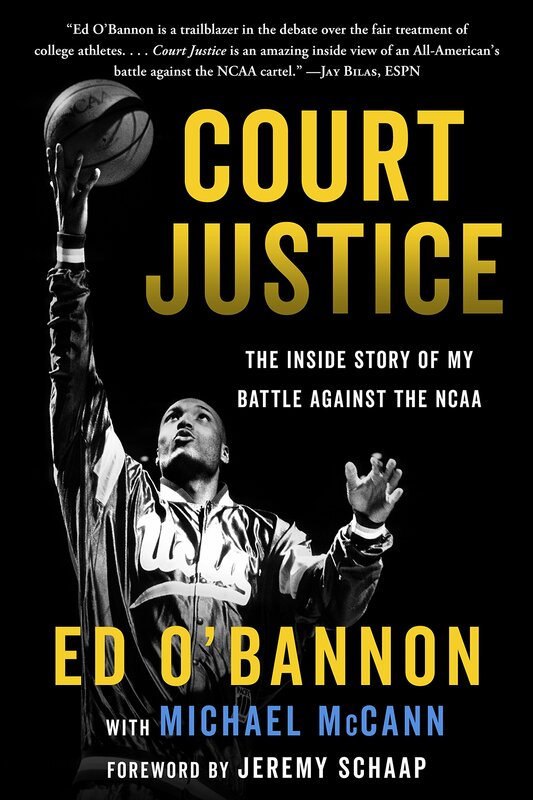 Court Justice is O’Bannon’s story, how this all came about, his legal battle against the NCAA and ultimately what can be done to correct a flawed system. O’Bannon received not a penny for his testimony in this trial. In fact, after playing basketball in the NBA for three seasons, then more internationally, O’Bannon went to work at a car dealership. While this was a book about money, it wasn’t about the money that he made (or didn’t make). It was more about the money the NCAA makes off its athletes and how the system is rigged against them. Court Justice thoughtfully and logically looks at the system based on one pretty high-profile athlete’s perspective. While not force-feeding you his opinion, O’Bannon allows readers to debate the issues for themselves. Although, one must admit, the fact that these institutions made money off his likeliness with him not receiving a penny is borderline criminal. O’Bannon also reminds us that the lawsuit changed his reputation. He went from tourney MVP and first round draft pick to “the guy who sued the NCAA over video games” when in his own mind he was only trying to right the system. O’Bannon humanizes his own experience while sharing it with the reader. A highly touted freshman at UCLA, he tore his ACL, unable to play for the rest of the season. The news made national headlines. While in the hospital, he received get well cards from Michael Jackson and Paula Abdul. He couldn’t help but wonder how many other freshman students would have received the same attention. You may be old school and think the system is fine the way it is. You may be new school and think the system is corrupt. But O’Bannon’s fight raises questions as to the future of college athletics and the way its student athletes should be treated. Electronic Arts having to reimburse former college athletes about $40 million is a sign that things might be changing. O’Bannon concludes Court Justice with potential solutions including allowing student-athletes to market themselves, involving students in the decision-making process, eliminating the transfer penalty and potentially supplying health benefits. O’Bannon has become a martyr. He’s been blackballed from holding any sort of networking or coaching gig that have anything to do with college basketball. How ironic that his efforts might become what end up changing the sport forever. O’Bannon doesn’t push his agenda; he defends his argument. Court Justice promotes dialogue that is sorely needed and debunks myths that have existed for far too long. It is a fair look at the state of college athletics. I’m not suggesting you change your mind to think college athletes should be paid. I’m suggesting you read this book and make that decision for yourself. That’s all he asks as well. This entry was posted in Featured, Hardwood and tagged Book Review, Court Justice, Ed O'Bannon, NCAA, Sonny Vaccaro, UCLA by Chris Humpherys. Bookmark the permalink. Outright paid, no….But I do think O’Bannon has a valid point when his name and likeness are used. They should get compensation for that whether it be video games, jerseys or otherwise. If name or likeness is involved, they deserve a cut. I think where the NCAA crosses the line is monetizing the players image and not allowing said player to participate in the revenue. Aren’t the players taken advantage enough in the name of the student athlete farce. The book was pretty solid. Moved through it pretty quickly. And all I’m saying is that it might make ya’ think differently about a few things. Electronic Arts ended up settling a pretty substantial amount that went to all the players images they used. I mean, it was only a matter of time, right? Like when guys tell chicks they’re trying to pick up that they read SportsChump to make them look smarter. All I’m saying is I should get some consideration. I don’t know if the power conferences will allow the NCAA to exist in its current form, but there appears to be no doubt the NCAA will forever fight the concept of paying athletes. That, of course, would destroy their “student-athlete” narrative they like to roll out 24/7. While the NCAA may give way to allowing early agent contact, going back to school if you don’t like your draft position, changing schools on a whim and being able to play immediately, etc., actually giving athletes money above and beyond their scholarship is something they can’t bring themselves to move on. Haven’t checked out the book yet, but am intrigued by your review to do so. I always found myself falling into the old school way of thinking. Don’t pay the athletes, an education is enough, how would we pay them all, bla bla bla. But O’Bannon’s argument makes you think, especially about the whole education argument. Schools DISCOURAGE kids from taking difficult classes because they know it will interfere with their athletics (or making them their money). What sort of education is that?